Just a year ago, I was the only kid at the SXSW Interactive conference without a smart phone; I wasn’t on Twitter; I rode a rusty bike to get around (at least until the chain broke), and I didn’t bother to bring my six-year-old PC laptop with me there, or anywhere, because it didn’t work unless it was plugged directly into an outlet. My philosophy was, “If it ain’t broke don’t replace it,” and my pride, making the best of what was already available. I was a “minimalist,” both in and outside the kitchen. Well, the times are changing, but that moniker still has significance. Because longtime food writer and author of my absolute favorite column, Mark Bittman, has teamed up with Culinate and Wiley & Sons to release an electronic application of Bittman’s classic cookbook, How to Cook Everything. I have it on my iPhone now. And soon, five of you can too, for free, by answering a question below. If you’d like to receive a free download of How to Cook Everything, just come up with a creative answer to this question in a comment on this post: What would you like to see a new food-related app for? I’ll select five winners at random. And now, a few questions for Mr. Bittman himself. Thanks to Culinate for helping set up our phone interview. Also, you can hear us chat more when Mark Bittman joins me live in the studio on Let’s Eat In on Monday, May 3th. So don’t forget to tune in for that! For now, let’s hear what Mark had to say about this app, the future of the cookbook, and his next projects in store. Me: So this iPhone app is really a milestone in food literature, or technology, as it were. MB: Do you think so? I haven’t been following the app world, I knew it was a huge deal to get HTCE in an electronic searchable form, and Culinate was really great at developing the shopping lists, timers, etc., but I didn’t really know until this week that it was sort of groundbreaking. So it’s really exciting, it’s really useful. Me: Do you think it’s more practical than the cookbook? Me: Well that’s where I do most of my cooking anyway! MB: (laughs) Well, when you’re thinking, what should I make? And suddenly, you have a database with 1,500 or more recipes, then you can take that to the supermarket and go shopping. 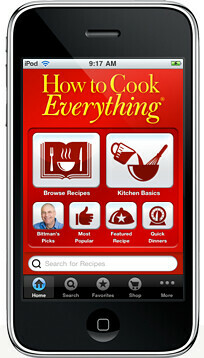 You can cook from the iPhone app, but I’d still rather cook from the book. Me: So maybe it’s a good device for beginners? Who are just starting to cook more. A lot of people ask me, how do I know what to cook with X? MB: Yeah, that’s true. 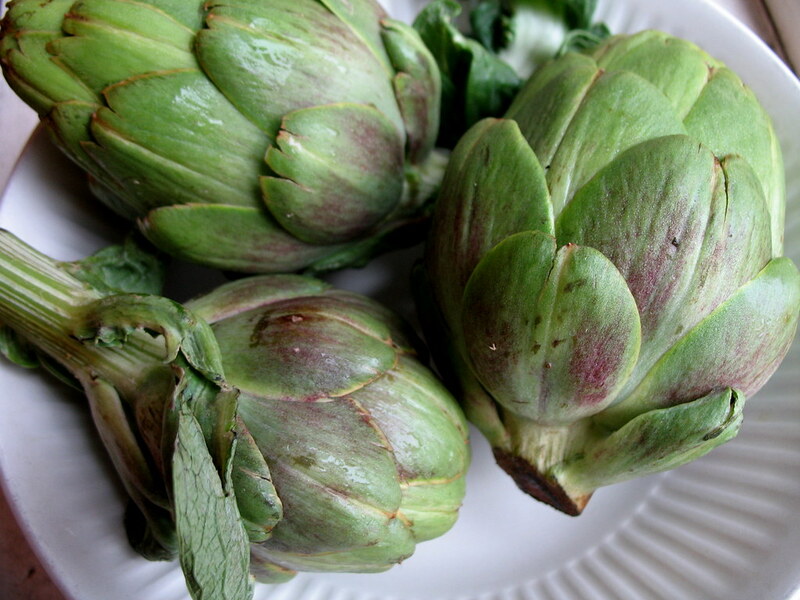 I think for me, I might say, I want to make a pasta with… I don’t know, artichokes, and, what am I forgetting? Oh yeah, I have to have some butter. Or, here’s some nice artichokes at the market, and on the spot look up recipes to make with them. Me: So since this app is really groundbreaking, would you consider yourself a pioneer in the food world? MB: Certainly not in the electronic food world. The short answer is no, I don’t. But when it came out ten years ago, How to Cook Everything was the first sort of modern, ground-up, basic, comprehensive cookbook that really took international flavors into it — maybe ever. There were international cookbooks before, but they didn’t incorporate standard American aesthetics and ingredients, and what you can find in average supermarkets. Supermarkets have a lot of international foods now, and that was not the case before. Among the biggest changes in American eating in the last twenty years is that maybe we’ll no longer think of European food as superior to Asian food. We were a largely European country for 200 years, and now, really, we’re not. I think the beauty of Asian cuisine in a non-specific Asian cookbook is a large part of its contribution, and I’m proud of that. Me: I know you must have learned how to cook many things after publishing How to Cook Everything. What are some of the foods or techniques you’ve discovered since? MB: I think if you look at HTCE and Food Matters, you can sort of see a general shift in style between less-meatarian cooking, I think it describes a lot of what I’m doing now, which is very vegetarian and vegan-friendly — there’s a lot of vegetarian recipes, that’s an overall trend in my cooking and I expect it will continue. I feel like I learned something and I do something new every day — I often wake up, like today, and I know I’m not home for lunch or dinner, so what I did was I looked around in my kitchen and saw some tomatoes on the counter, and had some baby artichokes and made a kind of artichoke and tomato stew. It’s about 8-10 baby artichokes, garlic and tomatoes. I don’t recall having made that before. And I’m really happy about that. It’s not revolutionary cooking, but I’ll probably blog about it, that’s the nice thing about blogging is that you can just do this, as I’m sure you know. Me: So do you prefer blogging, or electronic to print media? Are books dead? MB: I don’t think print is dead, there’s still a role for cookbooks in the kitchen, and if more people end up using iPads, it’s not that far from print. It can’t be free and there’s a whole discussion about that. I don’t think that good work by good people is going to be free, and we all should be able to discern between people who are just throwing stuff up there and those who are talented and hardworking and experienced, and is really worth something. This is not strictly a cooking question but a journalism question, it’s the same in the arts or anything — anyone can claim to be a painter, but presumably the cream rises to the top. Me: On that topic, what’s the story with this new markbittman.com site relaunch? MB: I haven’t thought about any sort of official launch publicity, hopefully it’ll be launched next Monday, on the day of your radio show, or the next, next Monday. But it will be much more dynamic and not a static site, with myself a bunch of other people blogging hopefully two to three posts per day, and not only food writers, but activists, farmers, producers, economists, anyone with something interesting to say in the world of food. It’ll sort of follow the salon type of blog, or a slog, where people can say what they want and meet and hopefully it’ll be a little more interactive. But we’ll see, I’m approaching it with great optimism and also great caution. We have a lot of exciting people who have decided to contribute. When I started markbittman.com, I didn’t know how popular it would be. It’s a tough world like with so many other sites, but I saw that there was a great need out there in the food world and I wasn’t doing what I should or could be doing for it, and I wanted to give this a chance, and to try it out. Me: Well I’m very excited about it. Thanks for sharing! 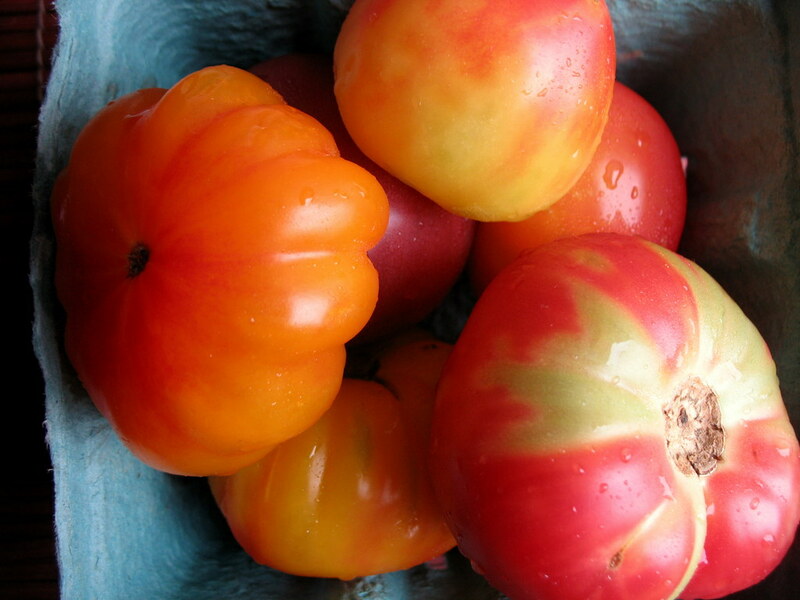 I would love to have an iphone app that would like me select the vegetables that we received in our weekly CSA basket and then match it with recipes. i want an app with instructional videos on everything from the basics, like how to chop an onion, to more complex projects, like how to make sushi, pizza dough, risotto, etc. of course the video cooking guide(s) would have to be very likable and generally awesome. it’d be like a choose your own cooking show on your iphone. I’d like an app that lets me voice record recipes, so when I’m in the kitchen I could prompt it to repeat the next step, thereby saving the work/hassle of constantly wiping my hands, turning away from the stove, dirtying up cook book pages or my iPhone screen. Maybe my favorite chefs/ authors could “read” their recipes and I could purchase them on the app! I’d love an app to combine random ingredients- you know, so that I could enter in “barley, red peppers, feta” and have it come up with the most fabulous salad for me or something! I would really appreciate an app that would let me input a few ingredients that I have on hand and generate some simple recipe ideas!